AndroidX Test is the new way of testing code that interacts with the Android framework, and it has the very nice feature of running the same test class on either an emulator (or physical device), or on JVM, through Robolectric. The main difference between the two testing environments is where the test is actually contained. 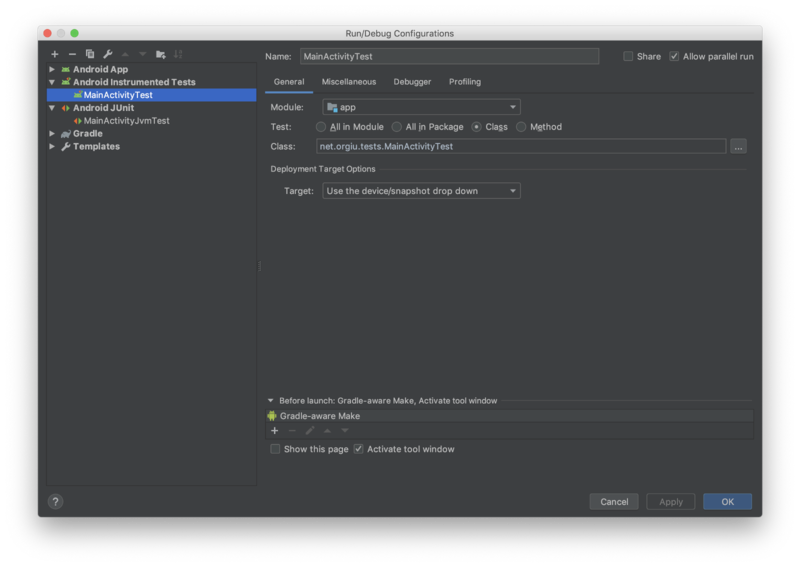 When we want the test to be run on device, the class should go in the androidTest folder, while using Robolectric implies that our files stay in the test folder. This distinction somehow limits the freedom to run the tests in a separate environment on a time by time basis, as each specific test must be in either androidTest or test folder. We might already be familiar with the idea of sharing some resources among unit and integration test, via a single folder: sharedTest. We can leverage this idea and move the tests we want to be able to run on different configurations to this folder, so that both test and androidTest source code can see them. Note the @RunWith annotation. This is not mandatory when running this test case as integration test, but we need it when using Robolectric to instruct the framework on how to run the suite. Latest versions of these artefacts can be found on Android Developers website. This step might not be necessary , and we should always check what defaults are. 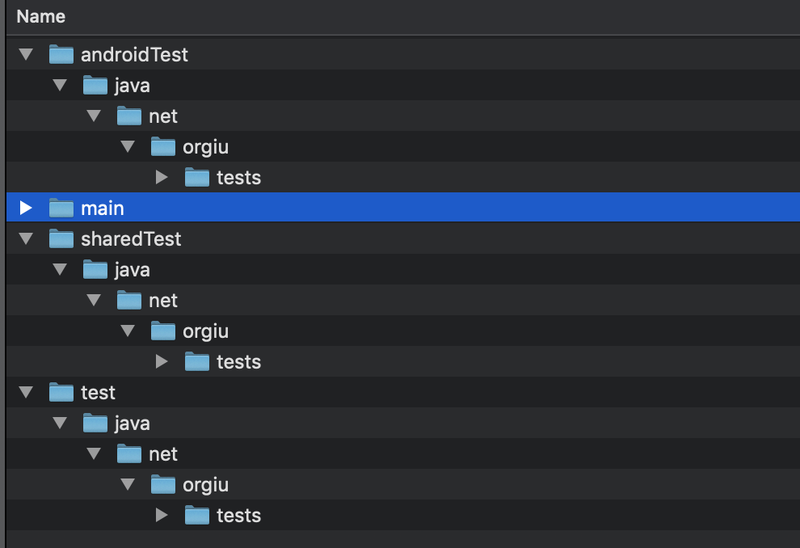 Note: in all my attempts, every time I ran a test from the sharedTest folder, using the little green play icon close to the class name, Android Studio interpreted it like a androidTest . Also, once I created a JVM configuration and run it, every time I then executed the test from the little play button, it would run on JVM. I am not sure whether this is the expected behaviour or a coincidence, but it was a curious thing to share. 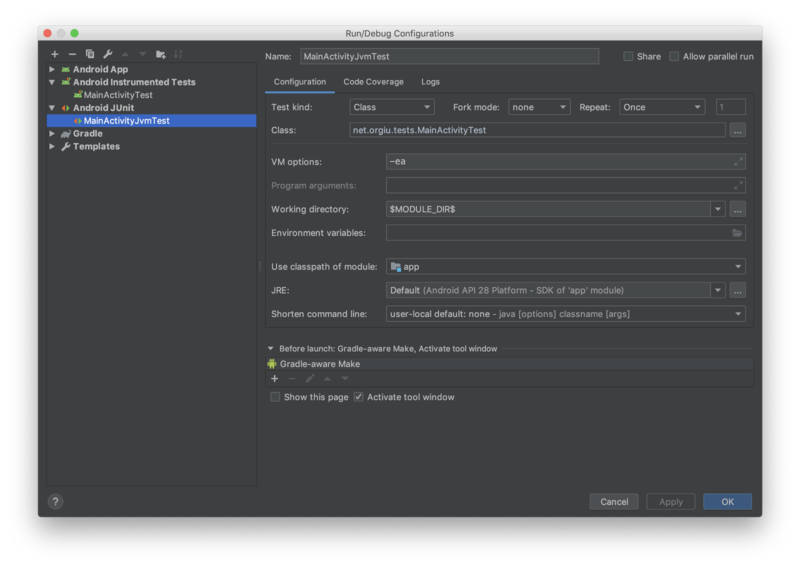 One thing worth remembering is that the two configurations might need a different name, because having them spelled in the exact same way could lead Android Studio to confusion: in our case, we simply added “JVM” to identify the configuration that will run locally from the one that runs on device. The procedure we just explored lets us run the test in both configurations, but if we use a CI this can become a flaw in our test routines: since our class is visible by both unit and instrumentation tests, the test cases contained in the shared folder will be run twice. The first one runs on a JVM when we execute the test task, the second one runs on a real version of Android when we run the connectedTest task. This can quickly become a problem if our test fails in only one of the two environments, so we need to find a solution that would allow us to run the tests where we need them, but only limit our CI to run them on a specific environment. This approach is really new and it still needs some refinements. There are situations in which this path can be really easy and help a lot, not only with Espresso tests, but also with Instrumentation ones and everything that relates to the Android framework. Anyway, if you want to check out this solution and explore how it works, or maybe give some advice on how to make things better, feel free to reach out the repository on GitHub. Thanks to Sebastiano Gottardo, Jose Alcérreca, Daniele Bonaldo, Fabio Collini, Corey Johnson, Sebastiano Poggi, and Howard Goldstein.